Lagoon and Trifid NebulaeLooking toward the center of the Milky Way galaxy we are treated to numerous glowing patches of glowing gas and dust. The three most prominent patches of nebulosity in this image are known , from L to R, as NGC 6559, M8, and M20. The large nebula M8 (M for Charles Messier) is commonly known as the Lagoon Nebula. The blue and red nebula at the top right is M20 and is commonly known as the Trifid Nebula. We are looking toward the center of the Milky Way galaxy in this image and the distance to these objects is approximately 4,000 light years. M8 and M20 are beautiful sights in a common pair of binoculars in the summer sky. From the northern hemisphere they lie due south after sunset in the summer months and are in the constellation of Sagittarius. Please click on the image or here for a larger presentation and more information on how the image was acquired. Solar disk in hydrogen alpha lightI have always admired the work of dedicated solar imagers like Greg Piepol and recently had an opportunity to work with some specialized solar imaging gear. The filter required for this very narrow band of light is very expensive. Larry Oyster let me take his TV102/Coronado SolarMax setup to the Green Bank Star Quest last month and we had beautiful skies to work with. For more information and a higher resolution image please click on the link here or click on the image. The image is at the bottom of the color astrophotography gallery listing. Thanks and stay tuned for many more images to come. 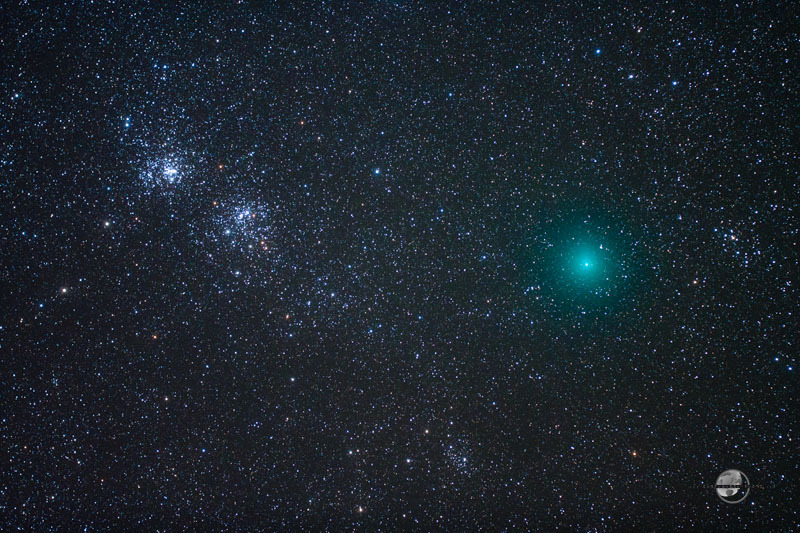 Comet Hartley and the Double ClusterThis image was taken from Spruce Knob in the highlands of West Virginia on October 9 at 1:00 a.m. The image shows the green glow of Comet Hartley 2 as it graces our neighborhood of the solar system on its latest journey to the sun. Also in the picture is the deep sky object known as the Double Cluster. The cluster is made up of two distinct open clusters of stars and are also know as NGC 869 and 884. The comet was visited by the EPOXI Mission spacecraft on November 4 and the amazing images from that visit are featured on this APOD page. The comet's closest approach to Earth was 11 million miles on October 28 and will visit our neighborhood again in April 2017.